DISCLAIMER Some of the garden pictures used in the marketing of this property were taken in the summer time and are for illustrative purposes only to show the garden out of the Winter period. This is a period detached cottage positioned in this popular location, adjacent to the church within the popular village of Upton. The property has been maintained and greatly improved by the current owners to offer a newly fitted Conservatory, fitted Breakfast Kitchen, Utility Room, further Conservatory overlooking the rear garden, Ground Floor WC, Family Room, Reception Hallway, Lounge, Dining Room, Study/Bedroom 4 (ground floor), First Floor Landing giving access to Three Bedrooms and Family Bathroom. Outside the property has a gated driveway providing off road parking for numerous vehicles, vegetable plots, double carport, shed and greenhouse and to the rear of the property there is landscaped gardens with a 32ft x 12ft pond, a lower lawned garden and seating areas. Viewing of the property is recommended to appreciate the ground on which the property sits and the location within this popular village location. LOCATION Upton is a small village which lies to the north of the historic Cathedral and University City of Lincoln and approximately 5 miles south-east from Gainsborough. There is easy road access to Lincoln and Gainsborough. CONSERVATORY ENTRANCE 18′ 1" x 10′ 8" (5.51m x 3.25m) , with tiled flooring, UPVC windows, feature brick wall, radiator, fitted blinds, double glass panelled doors to the kitchen. KITCHEN 18′ 3" x 9′ 9" (5.56m x 2.97m) , with UPVC vertical slide and tilt window to the rear aspect, tiled flooring, fitted with a range of base units and drawers with work surfaces over, Belfast sink with mixer tap above, spaces for cooker and fridge, wall mounted units with complementary tiling below, serving hatch to the conservatory, doors to the hallway and utility room, radiator and breakfast bar. UTILITY ROOM 5′ 0" x 5′ 3" (1.52m x 1.6m) , with UPVC vertical slide and tilt window to the front aspect, spaces for automatic washing machine and tumble dryer, work surfaces, stainless steel sink unit and drainer with mixer tap above and doors to the WC and family room. WC 5′ 5" x 4′ 9" (1.65m x 1.45m) , with tiled flooring, WC, wash hand basin, radiator and partly tiled walls. FAMILY ROOM 14′ 6" x 9′ 6" (4.42m x 2.9m) , with UPVC vertical slide and tilt window to the front aspect, beams to the ceiling, radiator and door to the rear conservatory. CONSERVATORY 13′ 8" x 8′ 8" (4.17m x 2.64m) , with tiled flooring, UPVC windows and wooden double glazed door to the side aspect, radiator and wall lights. 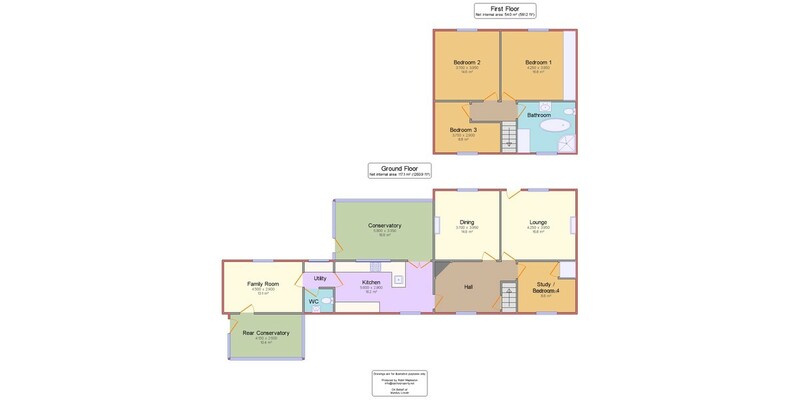 RECEPTION HALL 8′ 11" x 12′ 1" (2.72m x 3.68m) , with UPVC vertical slide and tilt window to the rear aspect, brick feature fireplace with tiled hearth, beams to the ceiling, laminate flooring, doors to the lounge, kitchen, dining room and study/bedroom 4, stairs to the first floor landing and an under stairs storage cupboard. STUDY/ BEDROOM 4 10′ 9" x 8′ 11" (3.28m x 2.72m) , with UPVC vertical slide and tilt window to the rear aspect, radiator, laminate flooring and door to the storage cupboard which contains the electric meter. LOUNGE 14′ 0" x 13′ 4" (4.27m x 4.06m) , with UPVC vertical slide and tilt window to the front aspect, door to the front aspect, open fireplace with tiled hearth and decorative surround, beams to the ceiling and radiator. DINING ROOM 12′ 2" x 13′ 0" (3.71m x 3.96m) , with UPVC vertical slide and tilt window to the front aspect, radiator, gas fire with tiled hearth and decorative surround, beams to the ceiling and radiator. FIRST FLOOR LANDING With doors to three bedrooms and bathroom and access to the roof void. BEDROOM 1 14′ 0" x 13′ 1" (4.27m x 3.99m) , with UPVC vertical slide and tilt window to the front aspect, radiator and fitted wardrobes. BEDROOM 2 12′ 2" x 13′ 0" (3.71m x 3.96m) , with UPVC vertical slide and tilt window to the front aspect, radiator and decorative fireplace. BEDROOM 3 8′ 11" x 12′ 2" (2.72m x 3.71m) , with UPVC vertical slide and tilt window to the rear aspect and radiator. BATHROOM 10′ 11" x 12′ 2" (3.33m x 3.71m) , with UPVC vertical slide and tilt window to the rear aspect, airing cupboard housing the gas central heating combination boiler and suite to comprise of stand alone bath, separate shower, WC and wash hand basin. OUTSIDE There is a gated gravelled driveway to the front of the property with a raised paved seating, a well with viewing area, covered veranda , a path to the front door, off road parking for numerous vehicles, decorative gravelled beds surround raised vegetable plots, greenhouse and a shed. To the rear of the property there is a feature pond 32ft x 12ft, decorative beds, paths to the side with mature shrubs, flowers and trees, steps down to a woodland walk area which leads to the lower lawned garden with circular box hedging and seating areas. SHED 14′ 6" x 8′ 8" (4.42m x 2.64m) , with door and window to the front aspect, power and lighting.